You can connect nodes by dragging cables from output ports to input ports. You can disconnect nodes by pulling on the cable connections. 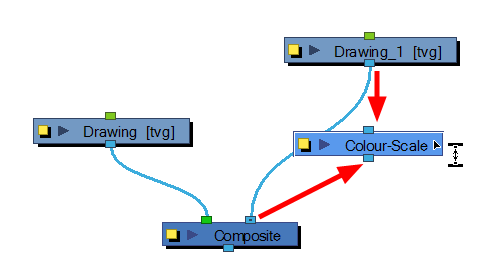 Extend a cable from the first node’s output port (bottom port) and connect it to the second node’s input port (top port). 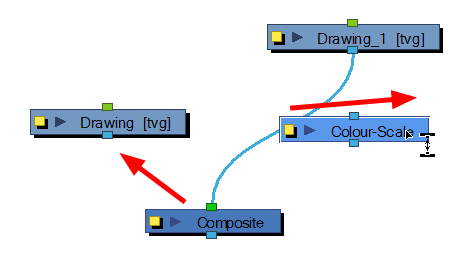 Select the node to connect, hold down the Alt key and drag the node on an existing cable. It is possible to create links between nodes in the Node view by clicking on one node and Ctrl-clicking (Windows) or ⌘-clicking (macOS) on a second port. Click a node and then Ctrl-click (Windows) or ⌘-click (macOS) the input port of a different node. The nodes are linked. Click the output port of a node, and then Ctrl-click (Windows) or ⌘-click (macOS) a different node. The nodes are linked. Click the output port of a node, and then Ctrl-click (Windows) or ⌘-click (macOS) a Composite node. The node is linked to a new input port of the Composite. Click a port of a node and then Ctrl+ Alt-click (Windows) or ⌘+ Alt-click (macOS) port of a Composite node. The selected port replaces the link in the Composite's input port. Click an output port of a node and then Ctrl-click (Windows) or ⌘-click (macOS) the input port of a Group node. The selected output port replaces the link to the group. Click an output port of a node and then Ctrl+ Alt-click (Windows) or ⌘+ Alt-click (macOS) the input port of a Group node. The selected output port links to a new in-port of the group. NOTEYou can reconnect a node's output port without disconnecting its destination port by dragging the connect from the output port to another output port while holding Ctrl (Windows/Linux) or ⌘ (macOS). In the Node view, select the node to disconnect, hold down the Alt key and drag the node away. You can also pull on the connection cable.